Great Downtown Wing Ding - Word on the street with Visit Minot!Word on the street with Visit Minot! Looking for a fun way to kick off the weekend? 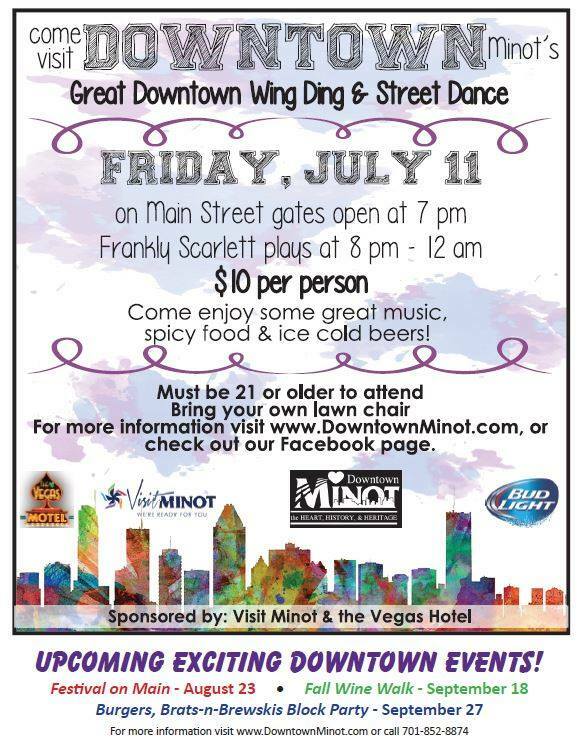 Join us Downtown this Friday (July 11th, 2014) for the Great Downtown Wing Ding & Street Dance! Friday night’s street dance will feature live music by Frankly Scarlett from 8pm-12am. Festivities will be held on Main St in Downtown Minot and gates will open at 7pm (must be 21 or older to be admitted). Enjoy food vendors, beverages, dancing and listening to a great local band. You’ll also have a chance to judge the best wing sauce. Gather your friends together for a fun-filled summer night downtown! For a list of other upcoming events this summer, make sure to visit our calendar of events here.